A whole new world of E.L.F. Make up and other beauty supplies have flown in on the Magic Carpet. 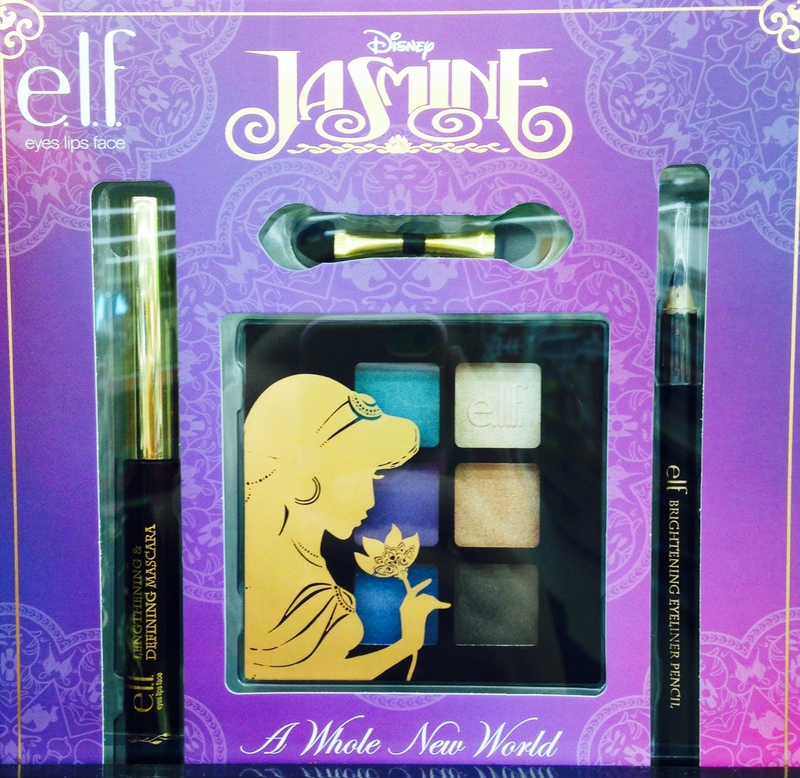 This new beauty collection, exclusively for Walgreen’s this new Disney Beauty Collection features, Princess Jasmine. I was beyond excited to see a Jasmine in the line up this year. The colors featured in this new Princess collection are rich, and vibrant jewel tones, with warm accents and shimmers. The collection offers make up from E.L.F, cosmetics bags from Soho, nail art kits from Kiss, Ardell lashes and fashionable hair accessories from Scunci. The display is a breathtaking back drop of purples and gold, with gorgeous outlines of the Agrabah Castle hidden within. The E.L.F. makeup is what always draws me in. I am fascinated by it’s on point color schemes, and pigment quality every time. The hair accessories always get me next, I love headbands so I was really excited to see one in this collection, normally it’s hairbands and elastics only. There are elastics in this collection and they are bejeweled and charmed like previous Princess and Villains collections. 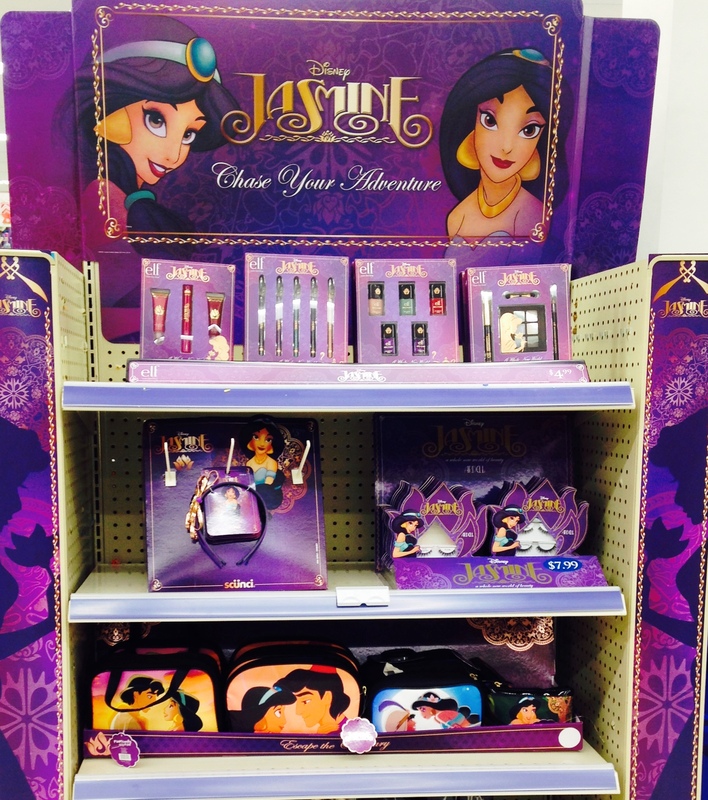 The cosmetics bags were super cute, and featured different romantic moments of Jasmine and Aladdin together. The lashes are pretty interesting, and one set actually has purple lashes mixed in to enhance Brown, Hazel, and green eyes! How fun is that? Not pictured is the Kiss nail art sets. 4 sets join this mystical adventure into beauty land, each set includes stick ons, bling, glitter, brushes and even the press on nails! 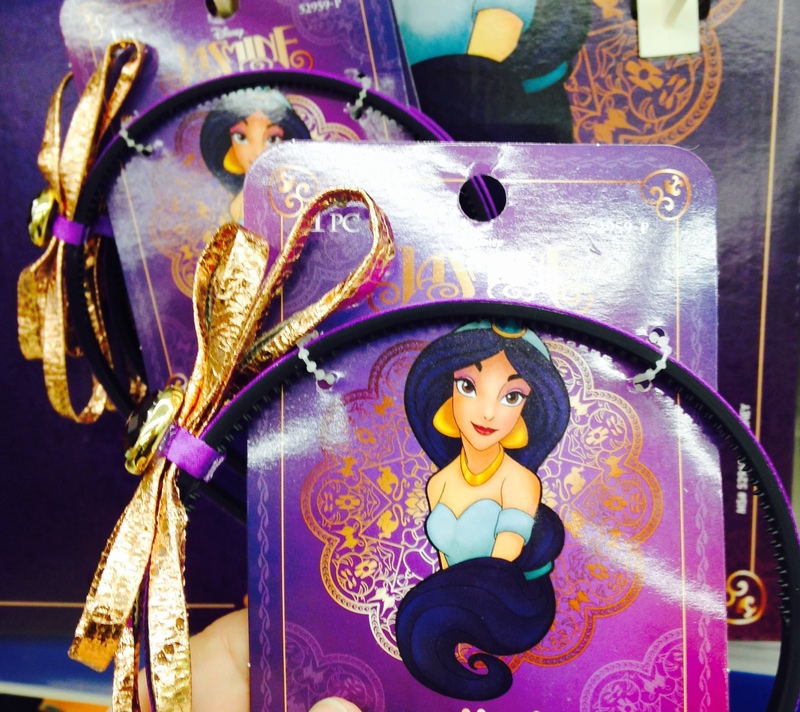 Jasmine Head band, with jeweled accent. Now let’s check out the makeup a little bit more! The eyes have it in this new collection, a 5 piece eye liner and sharpener set and a 6 pan shadow with mascara and liner both only $4.99. Also for $4.99 is a 3 piece lip set, and 5 piece polish. There is also a Beauty Book for $9.99, but I currently do not have it. 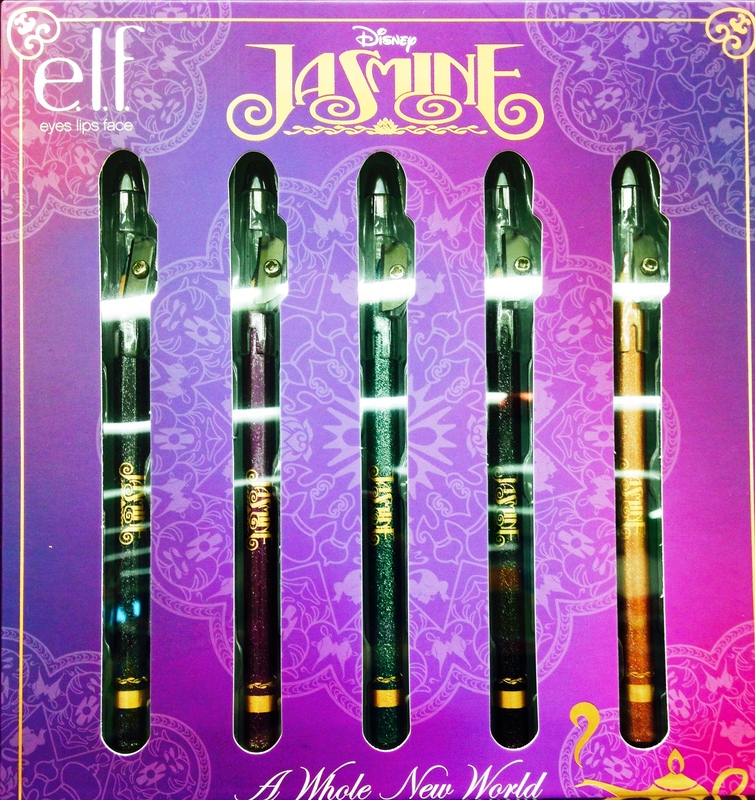 The 5 piece liner set is full of shimmery jewel tones. I really feel this set opens up a whole new world of ideas for winter eye pallets. The colors shout MAGIC CARPET to me, and there is something about the purple and gold pencils that I simply can not resist. I also love that each pencil has a sharpener, that makes it a very handy travel item for my adventures in the Disney parks. My absolute favorite item in this collection after the Beauty Book (which is currently not posted) is the Eye Shadow set. There is an E.L.F. mascara included, and their mascara is volumizing without being to heavy, which my sensitive eyes love. There is some very vivid purples and blues in the 6 pan shadows, but some balancing earthy tones to sculpt the perfect day or night look. The pencil is a basic black pencil, which is great for enhancing as little or as much as needed. I must say I am absolutely OBSESSED with the delicate gold silhouette of Jasmine on the eye shadow compact, I really can’t stop staring at it. 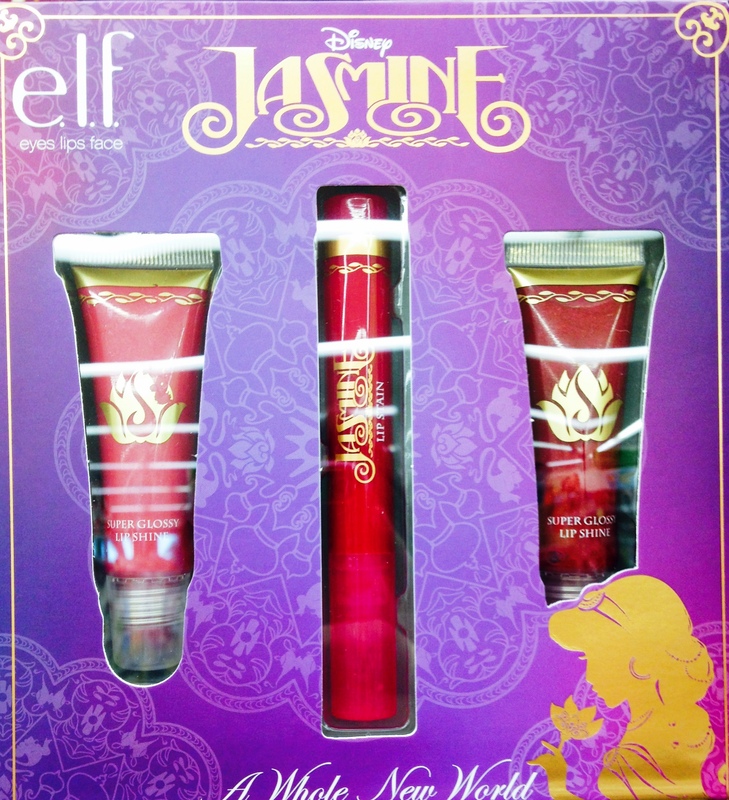 The lip set comes with 2 squeezey lip glosses and a lip stain. The glosses are a shimmery and translucent glaze in a softer pink, and a more sultry berry. The lip stain which is one of my guilty pleasures is a deep pink with a reddish hue that reminds me of a setting sun over rolling sands. You don’t need a lot of this gorgeous stain to get a deep long lasting color, and applying one of the sparkly lip glosses can lean it more towards day or night depending on the one you choose. 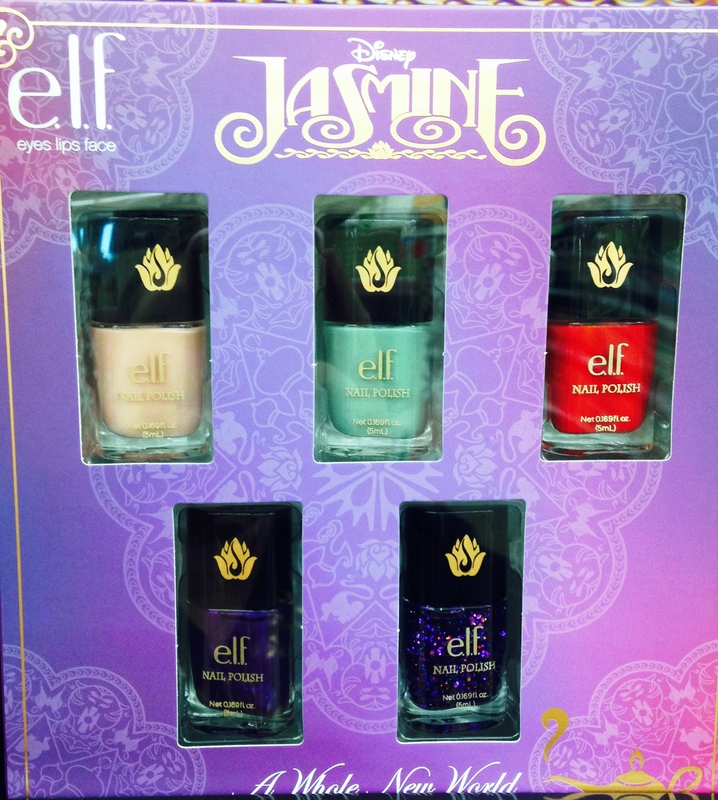 Finally we have the nail polish set. 5 varnishes come with this one, and there is 2 different purples, a basic and a glitter. The teal really mimics the color of Jasmine’s infamous outfit from the movie. I’ll admit the red kind of threw me, it’s much bolder than the rest of the colors through out the entire collection. It did give me a strong nostalgia of Jasmine when she was kidnapped by Jaffar though. These polishes dry much quicker than your usual drug store variety though, and that’s a big bonus for someone always on the go like me! I really feel this Disney Beauty collection hit one out of the parks this time! There’s so much to choose, from that I might just have to get everything! My name is Danielle Laroff. I am a Disney Specialist for Chip and Company and Disney Fashionista. I am also a Travel Agent with World of Magic Travel, the preferred agency used by Chip and the Disney Addicts and the Disney Fashionista. To plan one of these fabulous get aways to Walt Disney World Email me today at [email protected]worldofmagic.com. You can also visit my Facebook page, click here for more Disney deals, as well as fun Disney At Home ideas!